I've been having a problem with my driver's side window rattling and finally decided to figure out how to fix this issue. I've searched the subject a few times and found no clear answers on how to fix this so here it is. My GF went away for the weekend and took the camera with her so I'm going to reference pics from G35man04's https://g35driver.com/forums/body-in...l-removal.html thread. Also use this in reference on how to remove the door panels. Now on to the fun stuff, which turned out to be a pretty simple fix. 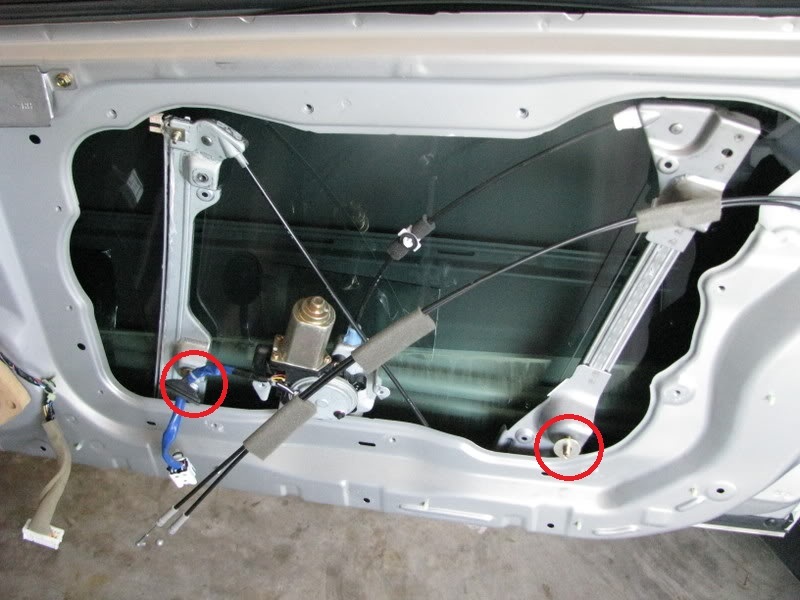 Once the door panel is removed locate the two nuts circled in red. These are attached to the studs that thread into the lower part of the window track. The nuts will most likley be tight and not appear to be the issue but they are. 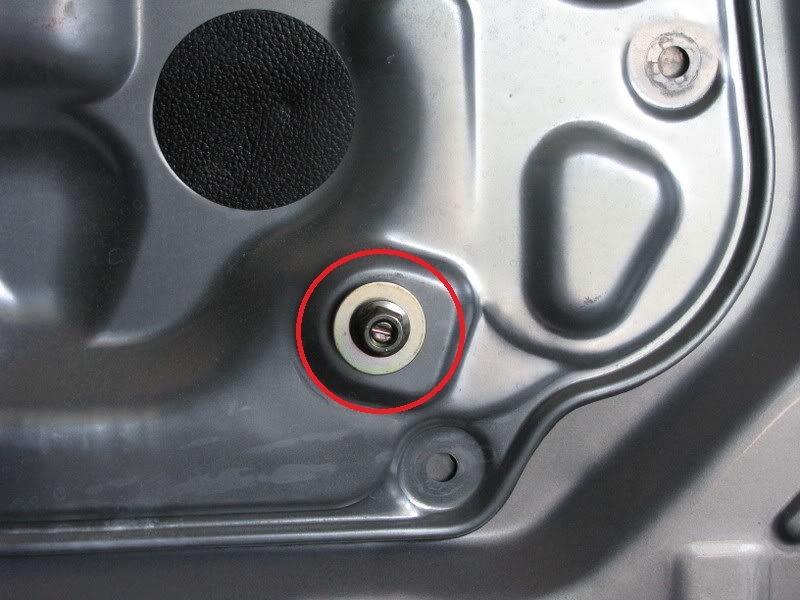 While it is not necessary to remove the metal panel you may want to so you can apply some loctite to the stud to prevent it from loosening in the future. Now remove the nuts one at a time so not to shift the possision of the window. Then using a flat head screwdriver tighten the studs, being careful not to overtighten and strip them. Here is a pic of what it looks like with the panel off and as you can see the stud is not fully screwed in to the window track, the washer like piece should be flush with the track ie screwed all the way in. This is what was causing the window to move around and make noise. I also noticed that there were rub marks inside the door at the base of the track caused by it moving around. Once these are fully tightened check to make sure the window operates smoothly. 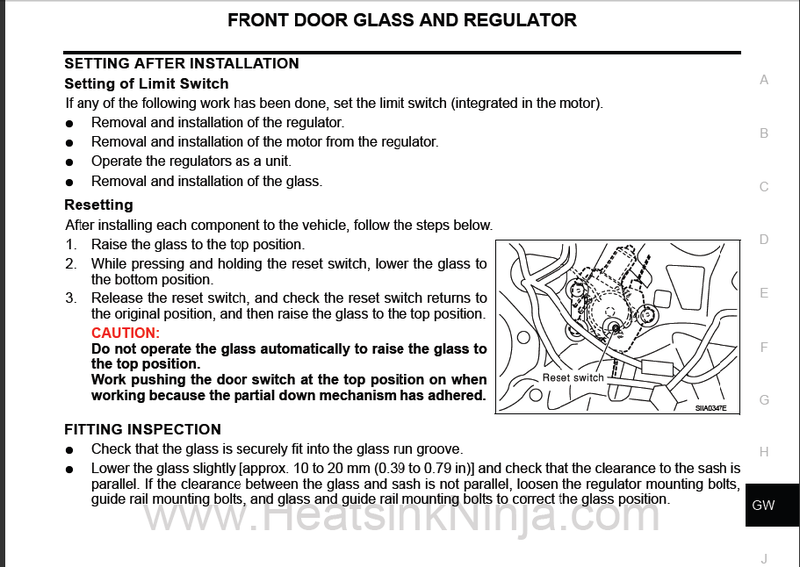 If there is any rubbing you may need to loosen the nuts on the bottom or the bolts on the top of the track and shift the window slightly and re-tightening. 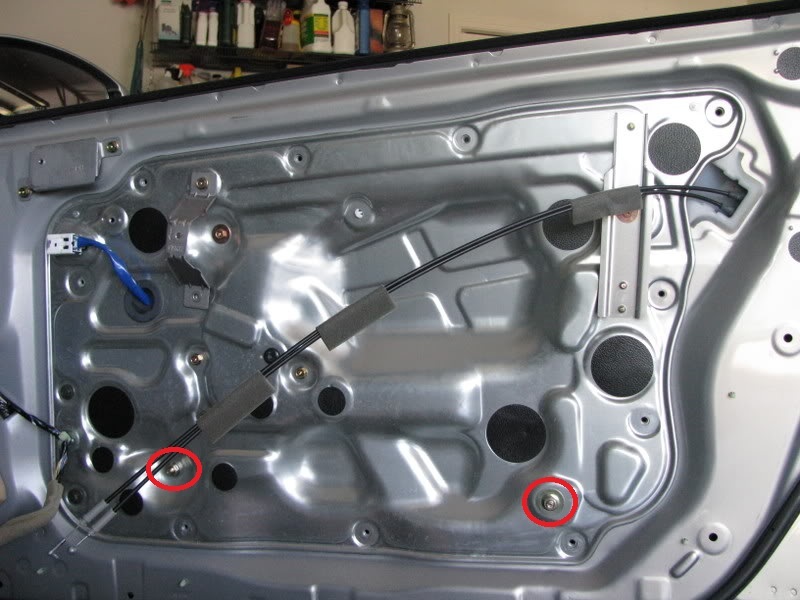 Now is also a good time to make sure the rest of the bolts around the panel are tight to ensure the door is rattle free. If you chose to remove the metal panel you will have to set the limit switch as shown here per the FSM, its kind of tricky to get it right so be patient, it has to be done in one motion without the use of the auto up/down switch. Once finished put the door panel back on pat yourself on the back and go have a cold one. Last edited by VQ Johnny; 08-31-2010 at 04:52 PM.